This facsimile display on the lower ground floor of the Sir Duncan Rice Library is part of the Oxford University 'Reading Euclid' project and spotlights three of the University of Aberdeen's own rare copies of Euclid's 'Elements'. Come and find out more about Euclid in the "Seeing Euclid" display. As part of Oxford University's Seeing Euclid project, the University of Aberdeen was invited to become part of a Euclidean network of Special Collections and Libraries showcasing their own rare, pre-1700, annotated copies of Euclid's Elements. The Special Collections contains a number of these unique and beautiful mathematical texts and Rare Books curator, Jane Pirie, has selected three particularly important examples to feature in a facsimile display that will be on show outside the Reading Room on the lower ground floor of the Library throughout the summer. Little is known about Euclid. He lived around 300 BC, was Greek, and taught mathematics at Alexandria in Egypt where he wrote the Elements of Geometry. Composed of 13 books on various sections of mathematics and geometry, it became the most revered and used textbook of mathematics for the next 2000 years. It is often claimed that it was the most commonly printed book next to the Bible in Western Europe. The significance of the Elements was such that it formed the basis of all teaching on geometry until the twentieth century. Euclid collected and refined all known geometry and mathematics from ancient Arabic and Greek teachings and presented them in a clear and logical way. 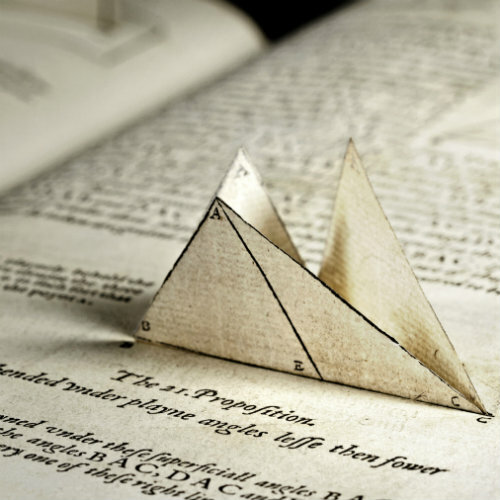 However, Euclid is credited not only with teaching mathematics but establishing methods of logical thought and deductive reasoning for all learning. There is no original manuscript of the Elements which survives and, until the invention of printing, the work was known only in a handful of manuscripts copied again and again over the centuries. There will be a rare opportunity to see the actual books at a special "Euclidean Collections Close Up" on Thursday 28th June, 1-2.30pm. Drop into the Special Collections Seminar Room, opposite the Reading Room on the lower Ground Floor of the Library between 1-2.30pm. The event is FREE and open to all.